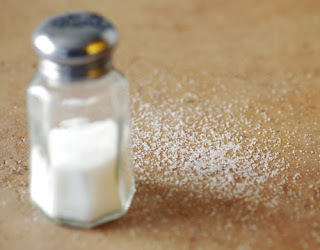 The Culinary Gadabout: "World Salt Awareness Week"
Salt has its own week: who knew? World Action on Salt & Health (WASH), whose mission is to improve world health by achieving a gradual reduction in salt intake, designated March 21-27 as the week's official 2011 dates. But even though the week has just ended, the need to be careful with salt will not. We all know that too much salt isn’t good for you, even if you don't suffer from hypertension. You probably know the obvious too-salted culprits: processed foods, lots of canned products, etc. But salt is hidden in ways many of us don’t realize. I recently watched a few 1.5-minute “shocker” videos about hidden salt in food and had some unpleasant surprises, the chief one being how salt-laden low-fat cottage cheese is; if you have a 1-cup serving of the stuff, you'll down half a day's suggested daily sodium intake. The videos were produced by the Los Angeles County Department of Public Health, and you can find them here. Other topics include salt in lunch meat, canned veggies, and ketchup.